Wow! That's crazy. Might have to get that. I like the SD card option. That's really cool. Wow, a total makeover, inside and out. The ability to load wavetables is pretty bitchin. I've got a pretty large kyma collection i'd like to throw into this! The infamous aggressive character of the Piston Honda is fully present, with the added clarity of the 16-bit wavetable engine. But yeah, would like to hear it first too. E352 looks like it'll be much better at clouds (8 vs 4 simultaneous waveforms?) and I cant see any control over the piston Honda's unison detune. This does look like a "both" situation. Chocolate and peanut butter. I'm actually wondering whether PHMK3 might be a contender to replace my HDMK2. Surprised to see the two CVs will accept *bipolar 10v* signals, which may be incompatible to the existing harvestman modules that works with 0-5v unipolar CVs. For example, the Stilton hammer mkII will not fully modulate PHmk3's waveforms by itself? Presets and SD loading is cool Curious of the morphing works. Really like the this thing will be a FM monster. I’m impressed it’s the same size. Wondering if the format will be the same as used in WaveEdit (by Synthesis Tech). Is there a single audio waveshaping input or 2 of them for stereo? I like having more screens but damn I wish they were a little bigger. YESSSSSSS. Haha, my bank account is f'd thanks to the Governor.... wish we'd get some news on BL II as well. 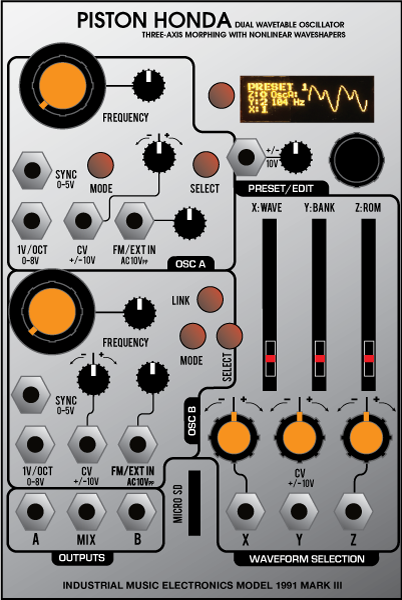 I'll definitely be snagging this as soon as it comes out, and it won't be replacing any of my other Harvestman modules.... I'm just going to build a separate case for them. This looks pretty awesome. I still burn ROM's for my MKI, but it's not for the faint of heart. Always wished the loading process was a bit easier. Might have to pick this one up. sd cards seems pretty fun.